SB-4148 is a high speed Video Bandwidth 310MHz, Maximum 380MHz VGA and Audio Matrix switcher product. Its one of the most innovative VGA/RGBHV and STEREO AUDIO (AR/AL) switching products on the market. 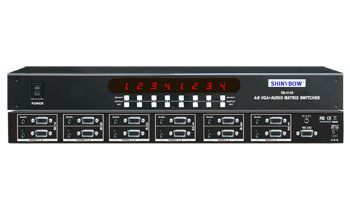 SB-4148 is a high speed Video Bandwidth 310MHz, Maximum 380MHz VGA and Audio Matrix switcher product. Its one of the most innovative VGA/RGBHV and STEREO AUDIO (AR/AL) switching products on the market Today. Support 19 inch Ear mount pair part number #1U-440L and MRM is 19 inch Rack mount type. It has 4 individual inputs with 8 individual outputs. Because it is a matrix router, any input may be routed to any output; or the same input may be routed to all outputs or any combination. It completely eliminates the need to constantly move around VGA and Stereo Audio input and output cables. This matrix switcher is ideally suited for full HD High Definition LCD TV or Plasma display monitor applications. Control is provided via Front pushbuttons with LED readout or IR remote controller. A RS232 interface is provided for interfacing with third party control. A Windows-based control software package is included to provide complete control of the SB-4148 from a PC.